O Lord, who in a time of turmoil and confusion didst raise up thy servant William White, and didst endow him with wisdom, patience, and a reconciling temper, that he might lead thy Church into ways of stability and peace: Hear our prayer, we beseech thee, and give us wise and faithful leaders, that through their ministry thy people may be blessed and thy will be done; through Jesus Christ our Lord, who liveth and reigneth with thee and the Holy Spirit, one God, for ever and ever. O Lord, who in a time of turmoil and confusion raised up your servant William White, and endowed him with wisdom, patience, and a reconciling temper, that he might lead your Church into ways of stability and peace: Hear our prayer, and give us wise and faithful leaders, that through their ministry your people may be blessed and your will be done; through Jesus Christ our Lord, who lives and reigns with you and the Holy Spirit, one God, for ever and ever. Before the American Revolution, there were no bishops in the colonies (partly because the British government was reluctant to give the colonies the kind of autonomy that this would have implied, and partly because many of the colonists were violently opposed to their presence). After the Revolution, the establishment of an American episcopate became imperative. Samuel Seabury was the first American to be consecrated, in 1784 (see 14 Nov), and in 1787 William White and Samuel Provoost, having been elected to the bishoprics of Pennsylvania and New York respectively, sailed to England and were consecrated bishops on 14 February by the Archbishop of Canterbury, the Archbishop of York, the Bishop of Bath and Wells, and the Bishop of Peterborough. 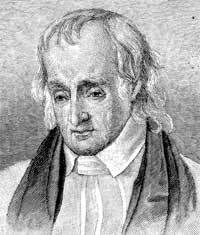 William White was born in Philadelphia in 1747, went to England in 1770 to be ordained deacon and priest, returned in 1772 and became first an assistant and then the rector of the Church of Christ and Saint Peter in Philadelphia. He served as Chaplain of the Continental Congress from 1777 to 1789, and then as Chaplain of the Senate. White was largely responsible for the Constitution of the Protestant Episcopal Church in the United States of America. At his suggestion, the system of church government was established more or less as we have it today. (What follows is a rough draft. I welcome notes of correction and clarification.) Only a bishop can ordain a deacon or priest, and only bishops (normally at least three) can consecrate a bishop. When a bishop dies or retires, a new bishop is elected by a convention in his diocese, in which clergy sit in the upper house and lay delegates (elected by the vestries of the local congregations) sit in the lower house, and a majority in each house is required to elect. (Afterwards, a majority of bishops and a majority of Standing Committees (each diocese has an elected Standing Committee) are required to confirm.) National business is conducted by the General Convention, which meets every three years and consists for voting purposes of three Houses: Bishops, Clerical Deputies, and Lay Deputies. A majority of each is required to pass a measure. (All the Deputies meet and debate together and are called the House of Deputies, but Lay and Clerical Deputies vote separately whenever any deputy so requests--in other words, whenever it might make a difference.) In all this, the Episcopal Church undertakes to follow, as nearly as modern circumstances permit, the government of the early church as attested back at least to the second and third centuries. A section follows from White's writings on Church Government. The power of electing a superior order of ministers ought to be in the clergy and laity together, they being both interested in the choice. In England, the bishops are appointed by the civil authority, which was a usurpation of the crown at the Norman conquest, but since confirmed by acts of parliament. The primitive churches were generally supplied by popular elections; even in the city of Rome, the privilege of electing the bishop continued with the people to the tenth or eleventh century, and near those times there are resolves of councils, that none should be promoted to ecclesiastical dignities, but by election of the clergy and people. It cannot be denied that this right vested in numerous bodies, occasioned great disorders; which it is expected will be avoided, when the people shall exercise the right by representation. The advocates for this form maintain, that there having been an episcopal power originally lodged by Jesus Christ with his apostles, and by them generally exercised in person, but sometimes by delegation (as in the instances of Timothy and Titus) the same was conveyed by them before their decease to one pastor in each church, which generally comprehended all the Christians in a city and a convenient surrounding district. Thus were created the apostolic successors, who on account of their settled residence are called bishops by restraint; whereas the apostles themselves were bishops at large, exercising episcopal power over all the churches, except in the case of St James, who from the beginning was bishop of Jerusalem. From this time the word "episcopos," used in the New Testament indiscriminately with the word "presbyteros" (particularly in the 20th chapter of the Acts where the same persons are called "episcopoi" and "presbyteroi"), became appropriated to the superior order of ministers. That the apostles were thus succeeded by an order of ministers superior to pastors in general, episcopalians think they prove by the testimonies of the ancient fathers, and from the improbability that so great an innovation (as some conceive it) could have found general and peaceable possession in the 2d or 3d century, when epicopacy is on both sides acknowledged to have been prevalent. The argument is here concisely stated, but (as is believed) impartially. White was Presiding Bishop of PECUSA at its first General Convention in 1789, and again from 1795 till his death on 17 July 1836. He was mentor to John Henry Hobart (see 12 Sep), Jackson Kemper (see 24 May), William Augustus Muhlenberg (see 8 Apr), and others.